Watching CNN last night it was clear that media culture is busily appropriating and sanctifying the Mandela legacy in much the same way it did with Martin Luther King, glossing over his more controversial and significant actions in favor of a comfortable, easily digested image. But the truth is that Nelson Mandela was a political leader and, for much of his life, a firebrand revolutionary. He was emphatically not some gauzy combination of Santa Claus and Jesus Christ. 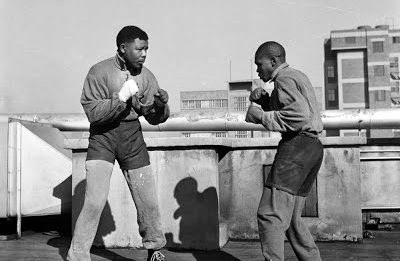 The first thing to remember about Nelson Mandela is that, before he was the world’s kindly white-haired grandfather, he was a large and powerful man who had near-obsession with physical fitness. As a young man he liked to box, and was good at it. One of the more striking things about his excellent biography A Long Walk to Freedom is how much of it is dedicated to recounting his various exercise routines. The third thing to remember is that while both Mandela’s personal charisma and his willingness to extend forgiveness to his bitterest opponents were morally magnificent in their own rights, they were just as much political tactics as they were dedications to a moral principle. Popular media tends to vastly understate the extent to which nonviolence is about power, struggle, and victory. Mandela was not a pacifist (in fact, under his presidency, the South African military briefly invaded Lesotho), he wanted to obtain freedom for his people by the best route possible. The same can be said about his post-Apartheid dedication to reconciliation. Make no mistake, Nelson Mandela was a great leader, a moral beacon, and in my view the finest diplomatist of the 20th century. Calling him the George Washington of South Africa, with respect, doesn’t give him nearly enough credit. This is why the more rough-edged facets of his character being airbrushed out of popular history is so offensive—it was precisely because of these that he had such brilliant success.